This time last year, millions of women marched across the nation to stand up for women's rights and against a newly elected president. About 100,000 people marched here in St. Paul. It was a turning point in the women's rights movement. This year though, the Women's March Minnesota is changing course. From the highly visible rally — to a more strategic endeavor. 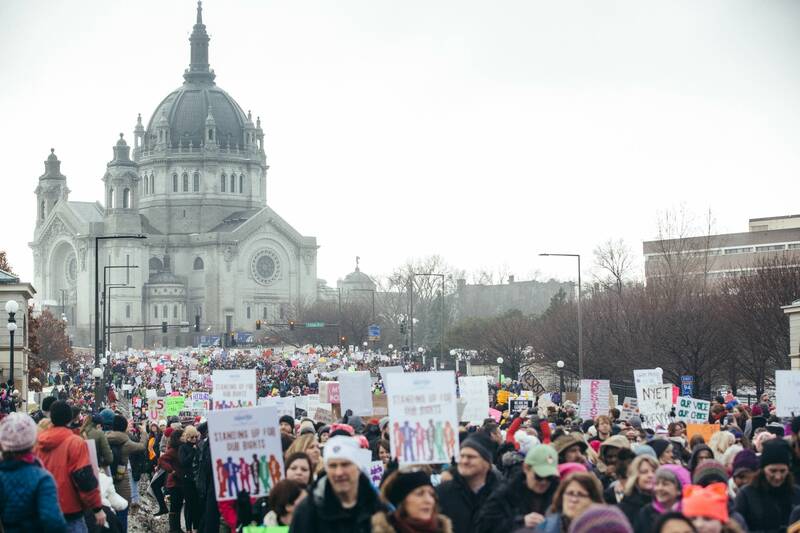 Co-founder of Women's March Minnesota Alicia Donahue will never forget the moment last year when she and thousands of women turned onto John Ireland Boulevard to head to the Capitol. She saw a sea of people. "At that point, I realized we were absolutely making history," she said. The 2017 Women's March will go down in history. But Donahue said the march in and of itself didn't create the change that activists want to see. Which is why the work continued throughout the year as groups fighting for the same causes organized and grew. It's also why this year's anniversary event is different. "Could we get another 25 to 50,000 people out at the Capitol on Sunday? Probably, and that would be amazing," Donahue said. "But we know that 2018 is going to be a tide shift in political year." Multiple offices are up for grabs this year including the governor's seat, both senators' and countless congressional offices. Donahue said this year provides an opportunity for political changes and high voter turnout. "We have the possibility to redeem ourselves and make some of those changes politically so that we have representatives that believe in the issues that we believe in," she said. This weekend, there are a few regional marches in Duluth, Rochester, Bemidji and Fargo. But in St. Paul, the Women's March isn't actually a march. It's a smaller gathering at Union Depot on Sunday afternoon. It was sold out at 2,500 tickets — asking people to pay whatever they can to raise money. It will feature a line-up of feminist leaders and artists. It will also include an action hour where participants can sign up to work with organizations who've been fighting for the same causes — not just women's rights, but civil rights and immigrant rights as well. Jammi Hansen Blair, board chair of Women's March Minnesota, said women across the political spectrum participated last year and learned about various issues. It's about a continued commitment this year. "To commit to getting involved in the political process in a way that maybe they hadn't done before," she said. "And maybe a way that is going to be greater than just showing up to vote." After a year where the #MeToo movement took hold, they hope that the rest of 2018 means shifting a moment in history to a much longer lasting movement.